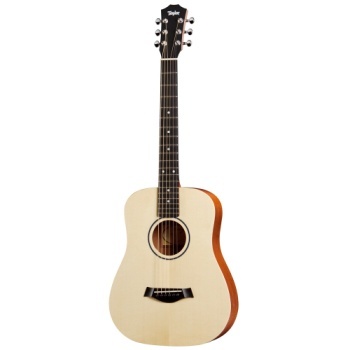 The 3/4 size Baby Taylor firmly established the travel guitar category years ago and today is more popular than ever. At the heart of it all is an authentic guitar sound and inviting playing experience. Featuring a sapele laminate back and sides and solid top of either spruce or mahogany, you can add a capo, high-string it, tune it down, play it around the campfire, help your kids form their first guitar chords â€” however you use it, it's always fun to have one within reach. The mahogany-top version will yield a slightly darker, earthier tone than the spruce top.